City Shopping Guide for italian island Sicily (cities and places Catania, Messina, Modica, Noto, Palermo, Ragusa, Siracusa, Sciacca, Taormina). Please pay attention: the cities are written after "/" behind the address. Brands: Acqua di Parma, Acqua di Taormina*, Alichimista, Byredo, Crabtree&Evelyn, Comptoir Sud Pacifique, Czech&Speak, Creed, Diptyque, E.Coudray, Heeley**, L'Artisan, Lorenzo Villoresi, Ligne St Barth*, Lampe Berger, Montale, Molinard***, Panama 1924, Profumum, Penhaligon's, Serge Lutens, ScentBar, The Merchant of Venice. There also used to be Annick Goutal, Carthusia, Dominico Caraceni, Gianni Campagna, Il Profumo, La Compagnie de Provence, Miller et Bertaux, Pecksniff's, Piazetta di Portofino, Reminiscence, Truefitt&Hill, Terry de Gunzburg. The branch at Via Petrarca, 3/A stocks at least Annick Goutal, Byredo, Creed, Caron, Diana Vreeland, Diptyque, Frapin, L'Artisan, Pantheon Roma, Profumum Roma. The branch at Viale Strasburgo, 42 stocks at least Acqua di Parma, Floris, Pantheon Roma. The branch at Via Principe di Belmonte, 100 stocks By Kilian, Frederic Malle, Jo Malone, Tom Ford Private Blend. Brands: Acqua dell'Elba, Amouage, Antonia Alessandria, Comptoir Sud Pacifique, Crabtree&Evelyn, CREED, DIPTYQUE, ETRO, Floris, Fragonard, Jean Patou, Jusbox, Knize, Les Parfums de Rosine*, Ligne St Barth, Meo Fusciuni, PENHALIGON'S, Rance, Robert Piguet, Santa Maria Novella**, Zuma. There also used to be Acqua di Genova, Czech & Speake, L'ARTISAN PARFUMEUR, Serge Lutens. 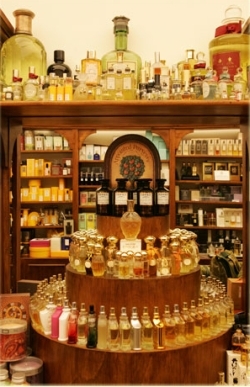 There's also another perfume store called Arena Barranco, which is located at Via Sella Quintino, 74. I am not sure, these two are of one owner, however the second store stocks such brands as Atelier Cologne, Bond No 9, Juliette has a Gun, Ligne St Barth, Lubin, Molton Brown. Brands: Acqua di Portofino, Hugh Parsons, Rose&Co. Brands: Morth, Mirko Buffini, Naomi Goodsir. Brands: Acca Kappa, Bois 1920, Eight&Bob, Laboratorio Olfattivo, Perris Monte Carlo, Robert Piguet, Unum. Brands: Acqua di Taormina, Comme des Garcons. Brands: Andy Tauer, Acqua dell'Elba, Acqua di Parma, Aedes de Venustas, Amouage, Amouroud, Antonio di Curtis, Antonio Alessandria, Atelier Cologne**, BLOOD Concept, Boellis, Caron, Carthusia, Ciatu the Soul of Sicily, Clive Christian, Creed, Dr Vranjes, Eight & Bob, Etat Libre d'orange, Etro, Fabio Lo Coco, Floris, Grandiflora*, Hugh Parsons, Humiecki & Graef, Il Profvmo, Initio Parfums Prive, Jeroboam*, Jean Patou, Jovoy, Juliette has a gun, Keiko Mecheri, Knize, L'Erbolario*, Ligne St. Barth, Lubin, Maitre Parfumeur et Gantier, Majda Bekkali, Mancera, Maria Candida Gentile, MariaLux, Mark Birley, Min New York, Meo Fusciuni, Masque*, Monom, Montale, Nasomatto, Olivier Durbano, Orto Parisi, Orlov, Parfums de Marly, Panama 1924, Puredistance, Prudence, Robert Piguet, Rose & Co Manchester, Royall Bermuda Limited, Rubini, Sir Harry Masaniello, The Party*, Teatro Fragranze Uniche, The Vagabond Prince, Tiziana Terenzi, Tuttotondo, Unum. Brands: Acqua di Taormina, Erbario Toscano, Geodesis. Brands: Autentica di Felsina, Astier de Villatte*, Andy Tauer, AEDES DE VENUSTAS, Antonio Alessandria, Atelier Cologne, Byredo, Dr Vranjes, Diptyque, Eau d'Italie***, Frederic Malle, Frapin, Grandiflora, L'artisan, Liquides Imaginaires, Lubin, Marc-Antoine Barrois*, Mona di Orio, Majda Bekkali, Maitre Parfumeur et Gantier, Neela Vermeire Creations, Oliver Durbano, Orto Parisi, Parfum d'Empire, Parco 1923*, Penhaligon's, The Different Company. Brands: Acqua di Taormina*, Annick Goutal, Acqua di Parma, Creed, Clive Christian, Esteban, Fragonard, Humiecki&Graef, Prudence*, Serge Lutens, Scent Bar, Truefitt&Hill. Brands: Acqua dell'Elba, Acqua di Taormina, Acqua di Portofino***, Annick Goutal, Bond No 9, Caron, Carthusia, Comme des Garcons, Comptoir Sud Pacifique, Creed, Diptyque, Eau d'Italie, Eight&Bob, Floris, Hugh Parsons, Hierbas de Ibiza, Houbigant, Il Profumo, Lorenzo Villoresi, Lubin, L'artisan, Maitre Parfumeur et Gantier, Oliver Durbano, Perris Monte Carlo, Profumi di Pantelleria, Panama 1924, Penhaligon's, Serge Lutens. Most probably also Acca Kappa, AMOUROUD, Amouage, Acqua di Genova, Crabtree&Evelyn, Czech&Speak, Costume National, Cale Fragranze d’Autore, E.Coudray, Etro, Fragonard, Geoffrey Beene, Jean Patou, Jean Charles Brosseau, Jean Desprez, Knize, Ligne St Barth, L.T. Piver, Miller et Bertaux, Marinella, Maria Candide Gentile, Nasomatto, PANAMA BOELLIS, Reminiscence, Rose & Co Manchester, Robert Piguet, TEA ROSE, Truefitt&Hill, Van Cleef & Arpels Collection Extraordinaire, ZUMA. Brands: at least Eolie Parfums. Probably also Acqua di Portofino, Acqua di Parma, Amouage, Comme des Garcons, Hugh Parsons, Panama 1924, Rose&Co. Brands: at least Acqua di Parma, Armani Prive. Brands: Acqua di Portofino, Evody, Hugh Parsons, Panama 1924, Rose&Co. Brands: Creed, Comme des Garcons, Francesca dell'Oro, Floris, Grandiflora, Heeley, Laboratorio Olfattivo, Lorenzo Villoresi, Serge Lutens. Brands: Eolie Parfums, Scent Bar. Brands: Acqua di Taormina, Acqua di Parma, Comme des Garcons, Melvita, Serge Lutens. Brands: Acqua dell'Elba, Acqua di Portofino, Carthusia, Eolie Parfums, Farmacia ss. Annunziata, Hugh Parsons, Lubin, Panama 1924, Rose&Co, Zuma. Brands: Acqua di Parma, Acqua di Taormina. Brands: at least E.Marinella, Etat Libre d'Orange. Brands: i profumi di firenze. Brands: Acqua di Taormina, Creed, Francesca Dell'Oro, Lorenzo Villoresi, Serge Lutens.